Improving women’s education could be the single most important intervention to reduce India’s anaemia burden, apart from nutrition and health measures, said a study published in medical journal BMJ Global Health in August 2018. For the study, researchers from poverty, health and nutrition division of the Washington-based International Food Policy Research Institute (IFPRI) and other institutions compared two rounds of India’s national family health survey (NFHS) data--2005-06 and 2015-16--and examined trends in anaemia for children six to 24 months old and pregnant and non-pregnant women 15 to 49 years old. A woman’s education proved to be most important factor in reducing anaemia in pregnancy, as per the study. In the case of children, interventions such as consumption of iron and folic acid (IFA) tablets, deworming and full immunisation and vitamin A supplementation worked best. They selected changes in 30 factors and used statistical process called regression to find out which factors drive change in anaemia levels. Anaemia is a condition in which a person has an insufficient number of red blood cells or quantity of haemoglobin, which reduces the capacity of their blood to carry oxygen. Normal haemoglobin for women is 12 gram per decilitre (g/dlL) and men 13 g/dL. Anaemia is widespread in India--58.6% of children, 53.2% of non-pregnant women and 50.4% of pregnant women were found to be anaemic in 2016, as per the NFHS. India carries the highest burden of the disease despite having an anaemia control programme for 50 years. Anaemia doubles the risk of death during pregnancy and leads to poor motor and mental growth in children. It can lower productivity in adults and cause a loss of upto 4% of gross domestic product, according to this study. This means a loss of $113 billion or Rs 7.8 lakh crore, which is five times India’s budget for health, education and social protection in 2018-19. Iron-deficiency anaemia was also the top cause of disability of India for 10 years to 2015, IndiaSpend reported in October 2016. While the mean haemoglobin rates increased for all groups in a decade, it did not rise enough to make a significant difference to anaemia prevalence. The highest decrease in anaemia was in children and pregnant women. The models used by IFPRI researchers could explain 49% of change in anaemia levels in children and 66% of difference in pregnant women. In children, decline in anaemia was explained by nutrition and health interventions (18%); women’s schooling (10%) and socioeconomic status (7%). Changes in meat and fish consumption, improved sanitation facilities, maternal anaemia and low body mass index contributed 2-3% each to the shift. Among pregnant women, fall in anaemia was explained by improvements in maternal schooling (24%), socioeconomic status (17%), and nutrition and health interventions (7%). Other factors included improved sanitation (9%), number of children under five years of age (6%), maternal age (2%), and meat and fish consumption (1%). 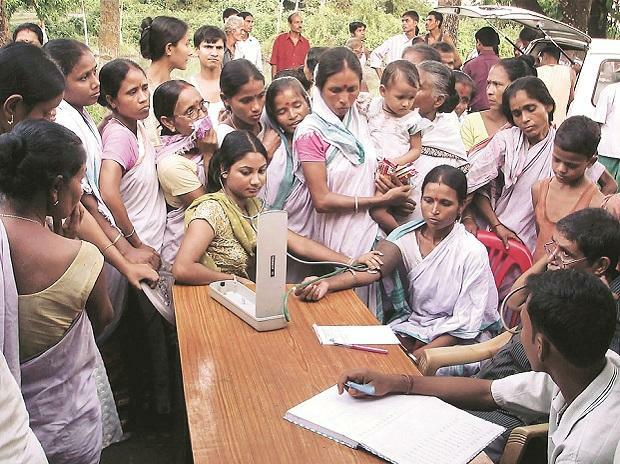 Health interventions targeted at pregnant women together with interventions for women and children during childhood--such as integrated child development scheme interventions for lactating mothers, paediatric iron and folic acid tables and deworming--could have led to the anaemia reduction in children, said the study. These services are now increasingly available but their coverage remains inadequate. In 2016, IFA consumption coverage was 30% in pregnant women, deworming coverage was 18% during pregnancy and 32% during early childhood. Anaemia persisted despite 50 years of National Nutritional Anaemia Prophylaxis Programme because iron supplements in adequate amounts reached all intended beneficiaries but were not actually ingested by all of them, IndiaSpend reported in November 2017. There was a 7- to 9-percentage-point increase in weekly meat and fish consumption between 2005-06 and 2015-16 and this led to about a 2-3% fall in anaemia. But while 80% of men and 70% women in India consume fish, eggs and meat occasionally, less than 50% of them do so even weekly, IndiaSpend reported in May 2018. Since eating non-vegetarian diets is expensive, dark green leafy vegetables may prove to be a good source of nutrients and prevent anaemia but NHFS data suggest that daily consumption of dark green leafy vegetables has reduced from 64% to 48% in the last decade. Women’s education explained 10% fall in anaemia among children and 24% in pregnant women. But 31.6% of women are still illiterate in India and only 35.7% have completed more than 10 years of schooling. Educated women have healthier children, IndiaSpend reported here, here and here. A one-year increase in age at pregnancy and a 10% reduction in open defecation could each result in a 3.5- to 3.8-percentage-point reduction in anaemia in pregnant women, IndiaSpend reported in June 2018. “One of the primary causes of school dropout in girls is early marriage, thus schemes that help delay marriage may also benefit anaemia in the long run,” said Scott. Improved sanitation played a role (9%) in reducing anaemia especially in pregnant women, and yet only 50% of households used an improved sanitation facility, according to NFHS-4. Also, social beliefs about caste impurity and pollution drove 44% of Indians in rural India to defecate in the open in 2018, IndiaSpend reported in January 2019. “Further investments in women’s education, women’s livelihoods and household sanitation are needed to optimally reduce anaemia among women and children” said the study. Though focussed mostly on pregnant women and children, India’s national anaemia programme started a weekly IFA supplementation programme for adolescents in 2013. But it was likely to be ineffective given that there was only a 1.7-percentage-point reduction (from 55.8% to 54.1%) in anaemia in girls in the last decade. Anaemia prevalence in 10- to 14-year-olds is not included in the national family health survey but other studies showed that it is up in early adolescents from 50-90%, IFPRI researchers said. Also, since Indian girls begin menstruation between ages 12 and 14 years and 8% have their first child between 15 and 19 years, it is important to intervene early and track this group, the study said. In low income countries, only 15-25% of anaemia with high inflammation is caused by iron deficiency, showed a highly cited 2016 paper published in global journal Nutrients. When 75-85% of anaemia is unrelated to iron deficiency, iron supplements will not address the problem, said Scott. Other causes of anaemia include worm infestation, malaria, and infectious diseases that cause intestinal inflammation causing reduced nutrient absorption, genetic causes that affect red blood cells, blood loss, and deficiencies in nutrients other than iron such as folate, vitamin A and B12. Other than folic acid deficiency, those causes are not addressed by IFA supplementation. “This may be why 50 years of IFA supplementation in India has failed to address the problem,” Scott said.